In this beer blog, we are going to get into one of my favorite India Pale Ales. 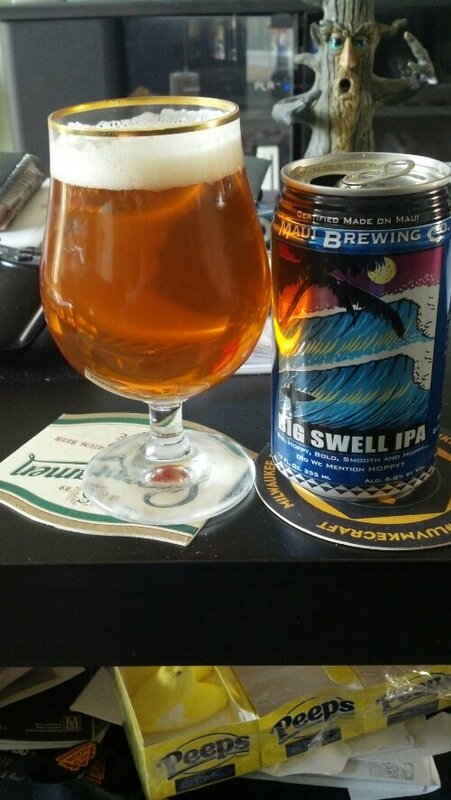 It is from Maui Brewing and the beer is called Big Swell IPA. If you read my earlier blogs on their beers, you know the history of this brewery. If you have not, please, read that beer blog to get up to speed on this great brewery. Let us get into this American India Pale Ale. It has a clear copper color with a constant white head. The smell is a tropical fruit smell which I have no idea which one. It is a nice smell to the beer. The taste is sweet carbonation hop with a hop and malty aftertaste. This is a different tasting India Pale Ale than anything in the market. It is a pretty drinkable beer. Big Swell IPA is a fresh handcrafted India Pale Ale brewed with huge amounts of American hops and malted Barley… dry-hopped to perfection! Our handcrafted India Pale Ale brewed with four different kinds of Northwestern hops and malted barley …dry-hopped to perfection. Its flavor begins smooth and malty and is followed with a big burst of hop flavor.